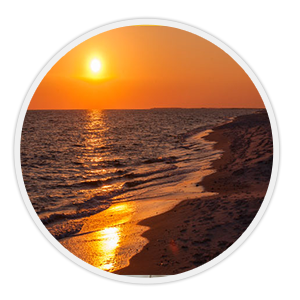 Looking for things to do in Dauphin Island? When you visit the Island. Not only are you surrounded by beautiful beaches and warm waters, you are surrounded by choices! From nationally recognized attractions to outdoor activities and more, there are plenty of options to entertain all of your family and friends during your time here. From the mysterious swamps of the Delta to the sparkling waters of the Gulf of Mexico, the Estuarium will take you. 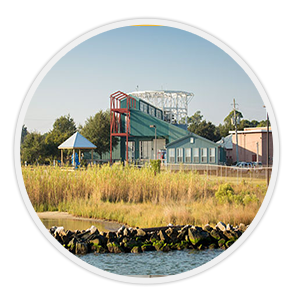 Exciting exhibits and interactive displays make science come alive at this spectacular facility, located on historic Mobile Bay. 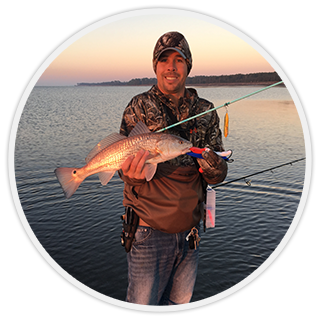 The Dauphin Island Sea Lab is the state of Alabama’s marine science research and education center. For over 40 years the Sea Lab has been conducting marine science research as well as teaching undergraduate, graduate and K-12 students. Last year over 11,000 K-12 students from across the region participated in marine science classes, utilizing our dorms and cafeteria. The Estuarium is a public accessible aquarium that features the animals and plants that are found in the Mobile area from the freshwater Delta to the Gulf of Mexico. Experience touching cownose rays and visit our unique gift shop. The Estuarium is an ocean experience for all ages. 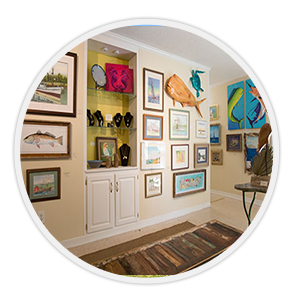 Located on the east end of Dauphin Island, at 101 Bienville Boulevard. Located at the western tip of Dauphin Island. West End Beach will be open Saturdays and Sundays 10:00 AM – 6:00 PM. Clean a/c restroom & showers, chair & umbrella rentals, jet ski rentals, snacks, sodas, water and adult beverage vendor. Picnic tables available on a first come basis.Park will be closed Mondays thru Friday during the day however it will be open at night from 6pm to 6am for fishing, watching sunsets and walking on the beach. There will be no amenities available at night. Summer Season April thru Labor Day, after Labor Day, open Saturday & Sunday only, weather permitting. Absolutely no pets, no glass and no grills, no fires and no overnight camping allowed. 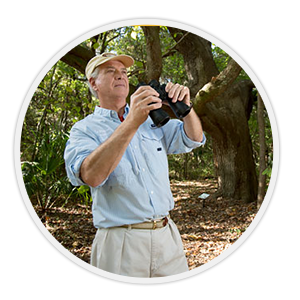 The Dauphin Island Audubon Bird Sanctuary – 164 acres of beautiful woodlands with miles of walking trails through pines, live oaks, magnolias, swamps and along Gulf beaches. Especially popular is the 1/2 mile nature interpretive trail loop which includes the fresh water lake, dune systems, Gulf beach and swamp. The trail features educational signs explaining the various animals, vegetation and their interconnection in these eco-systems. A 1,000-foot boardwalk (handicap accessible) leads from the parking lot to a wharf overlooking Galliard Lake with a breathtaking view. Egrets and herons hang out in the late afternoon. Dauphin Island is classified as a “Globally Import Bird Area” by the American Bird Conservancy, and is well known as one of the best places in the country to observe “neotropical migrants” – a term for those flying south each fall to the tropics, and north each spring. Dauphin Island has been voted “America’s Birdiest City” for the third consecutive year. Surround yourself with nature as you trek along a 1,000-foot-long board-walk through swamps, dunes and the Gulf shoreline at the Audubon Bird Sanctuary. Observe nesting platforms and catch glimpses of the hundreds of species of birds that migrate through this island habitat. Explore over 155 acres of maritime forest, marshes and dunes, including a lake, a swamp and a beach. Surround yourself with warm rays as soft, sugar white sand squishes between your toes and the blue waters of the Gulf of Mexico lap at your feet. Bring the whole family, even your four-legged members, down to Dauphin Island Public Beach & Pier for some much-needed time away from the hustle and bustle of everyday living. 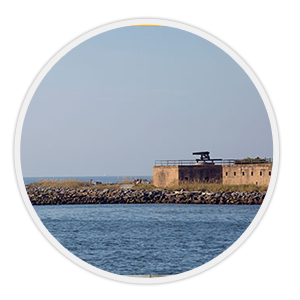 Construction began in 1821 and was completed during the Civil War with additional batteries added in the Spanish-American conflict. It has been called one of the best preserved examples of 19th-century brick seacoast fortifications in the east. It was a key element in the battle of Mobile Bay, famous for Admiral Farragut’s command “Damn the torpedoes – full speed ahead!” See actual cannons used in the battle, the huge anchor of Farragut’s flag ship, tunnels, original blacksmith shop, bakery, latrine, Quartermaster building, Officer’s Quarters building, museum and gift shop. Self-guided history brochure available at entrance. Renowned living history events including the colonial period are held throughout the year.